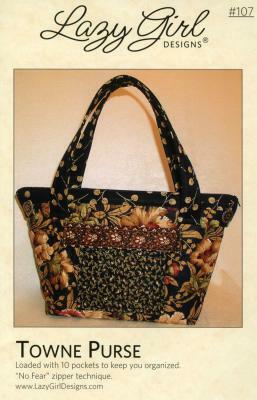 The Towne Purse pattern is a stylish quilted fabric purse that easy to make and very functional. The Towne Purse design features an interior loaded with 9 pockets for everything from your cell phone and sunglasses to pens and a nail file. The zipper is inserted using lazy Girl's trademark 'No-Fear" zipper instructions. Finished size is Approx 14" x 8.5". There is also a bonus project for the left over pieces is included in this pattern.